We recently purchased a couple of pieces of furniture for extra storage. We received so many beautiful items from wedding guests and wanted a way to display them. 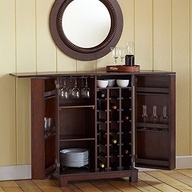 It's perfect to house our wine glasses, wine, and cocktail set. We chose a small corner to place the bar so ours can't extend all the way out (we can always move it if we are entertaining). Our guest mat from our reception was perfect to hang above it. We also display our aerator and R's scotch decanter and glasses. Here is a picture of the doors opened. We have glasses on both sides and on the top two racks. Wine and cocktail tools are on the bottom shelf. The side and leaf on the left is fully extended to show that it can be completely opened for serving. We purchased a china cabinet for our dining room too. I hate that the lighting is so bad! We took these pictures at night. There is nothing wrong with the finish but it isn't my taste. The plan when we move into a house with a garage is to strip it and re-stain it a darker color. The mirrors in the cabinet are dated so I may remove them eventually. A small project, and one that will be accomplished quickly, is to replace all the hardware - we are hoping to do that in the next month. I really dislike the dated brass pulls. This is a close up of the cabinet with our wedding cake topper nestled on the first shelf. This is our china pattern, the Kate Spade by Lenox Library Lane with the Larabee Dot accent plate. I love it! We have six complete sets so far and I hope I continue to collect them for holiday gifts. They are beautiful! 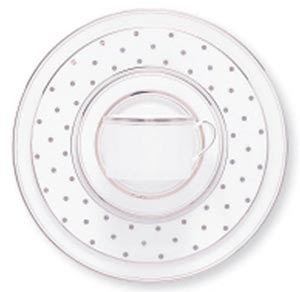 I plan to use the accent plate for desserts. I like that I can have everything displayed. It sure beats having boxes of dishes stacked in a spare room!